The technology of the future. GT cranes Gruniverpal has been producing mobile cranes and electrohydraulic lifting equipment since 1954. It is a reference point for different sectors: from plastics and tyre moulding to automotive, from aeronautics to the military sector. Cranes for presses with clamping forces up to 50.000 kg. Mobile cranes and spider cranes with lifting capacity up to 25.000 kg. Lifting capacity of up to 40% more than traditional cranes of equal size. These mobile cranes are suitable for indoor and outdoor use in both civil and industrial environments. Precision handling of these crawler cranes series is assured, even in restricted areas, thanks to the rotating boom with 220 degree to the left and right as well as the hydraulic controls. Special long-life batteries and competitive maintenance costs ensure a long life of the products. Gt cranes Gruniverpal’s technology is also one step ahead in the tyre vulcanization market. For this reason, it is the range of mobile cranes chosen by the world’s largest manufacturers of tyres and inner tubes: motorcycles, light vehicles, cars, trucks and heavy equipment, earthmoving, civil engineering, aviation. The universal range of these electric cranes are ideal forlifting awkward loads and handling tyres mould in limited spaces. Hydraulic jack options are widely considered as the best when it comes to lifting heavy equipment, machinery and loads. Many industries require such solutions for lifting equipment. A few examples include companies that build equipment parts, companies that run factories requiring heavy machinery, and companies that need to shift mass amounts of food products or livestock feed. A range of optionals reinforces the concept of ‘on demand’ in Gt cranes Gruniverpal’s design and production. Every single detail is viewed as a personalized response to customer needs. Optional for mobile cranes, aerial platforms, ATEX crane, compact cranes, lifting robots, special lifting machines, in particular for lifting moulds. We build electric cranes designed for every business need. Request a quote for our electric cranes. We lift a wide range of loads with our mobile cranes. We are able to offer you any lifting cranes for industrial applications. The product customization is the basis of every our project. Every customer – from large to medium-sized businesses – has their own specific needs. Their demands are the real driver to invest in research and ensure flexibility in the offer. Ask for advice on which crane you require. Do you need an electric self-propelled crane to lift very heavy loads? Do you need to move loads in very tight spaces? If you need a crane for any kind of lifting, please get in touch for advice. Our know-how gained over sixty years of success allows us to offer you the solution to any problem of industrial handling. We are here to help you. GT cranes Gruniverpal: lifting equipment. Since 1954. Our production is diversified – from mobile cranes to aerial platforms up to special lifting machines, particularly for mould lifting. WHY DO PEOPLE LIKE US? Every customer, from large to medium-sized businesses, has their own specific needs. Their demands are the real driver to invest in research and ensure flexibility in the offer. From plastics and tyre moulding industries to automotive, from aeronautics to the military sector, Gruniverpal is a key reference point for various sectors. Every morning. Gruniverpal staff knows it – the future begins today. The clearest expression of an industry leader with a broad horizons vision. 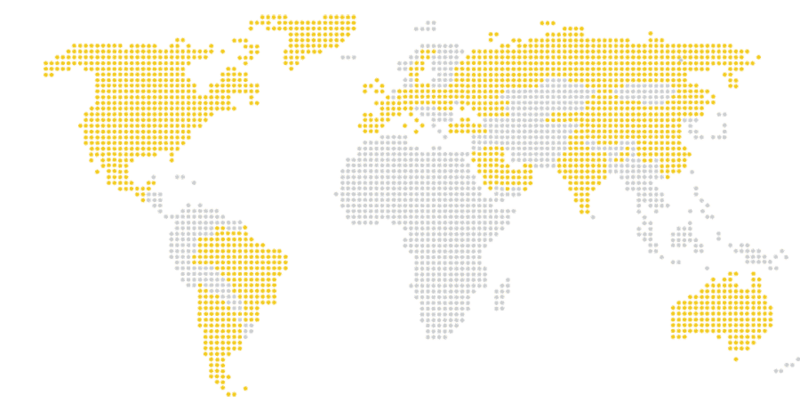 GRUNIVERPAL WORLDWIDE: OUR DISTRIBUTION NETWORK.